A recipe for Grape Focaccia, a homemade yeast bread topped with seedless grapes and flavored with fresh rosemary, thyme, and extra-virgin olive oil. Use shortening or olive oil to well grease a large bowl. Heat water to 100 to 110 degrees F. Stir together warm water, yeast, and honey in the bowl of a heavy-duty stand mixer. Let stand for 5 minutes. Add flour, salt, and 1/4 cup olive oil. Mix on low speed using the flat beater until combined (about 30 seconds to 1 minute). Change beater to dough hook. Add thyme and rosemary and knead with dough hook for 5 minutes at the speed recommended by your mixer's manufacturer for using the dough hook (usually medium-low to medium speed). Dough may be sticky. Place dough in the greased bowl, turning to coat dough surface. Loosely cover with plastic wrap and let rise in a warm draft-free place, about 1 to 1 1/2 hours, or until doubled. Drizzle 1/4 cup olive oil in a jelly roll pan. Use your fingers to press down and into the edges of the pan. Use the tips of your fingers to make indentions in the dough. Cover with plastic wrap and let rise in a warm draft-free place for 1 hour. Pre-heat oven to 425 degrees F while dough is on the second rise. Scatter grapes over dough and drizzle remaining 1/4 olive oil on top. Bake for 30 minutes or until golden brown. 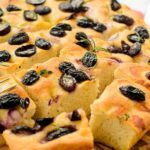 A recipe for Grape Focaccia, a homemade yeast bread topped with seedless grapes and flavored with fresh rosemary, thyme and extra-virgin olive oil.